This course is for the expert user who has good experience with Microsoft Excel or has completed the five courses in our Beginner Series plus Expert Level 1, 2, and 3 classes. This course will teach you how to work with lookup functions in Excel. 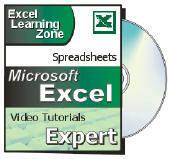 We will begin by learning about VLOOKUP which is one of the most popular, and versatile lookup functions. You will see how to take any date, figure out what day of the week it falls on, convert that to a number (1-7), and then look that number up in a table to display the full text of the weekday name, like "Wednesday." Next you'll learn how to perform a range match with VLOOKUP. This will let you find a value that's less than or equal to your lookup value. 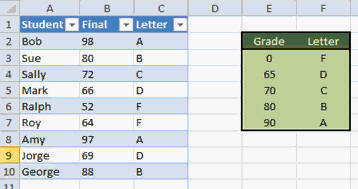 Now you can take a student's final average and look up a letter grade. In the next lesson, we'll build an employee time sheet. You'll enter in the employee's name, start time, end time, and the number of hours he worked. We'll again use VLOOKUP but this time we'll perform an exact match to find the employee in a separate worksheet and return his pay rate. Now we can calculate his total pay for the day based on that and the number of hours he worked. Next we'll learn about some functions that are related to VLOOKUP, including HLOOKUP and LOOKUP. We'll then learn about MATCH and INDEX which are very powerful functions when used together. They can do things that VLOOKUP can't do. 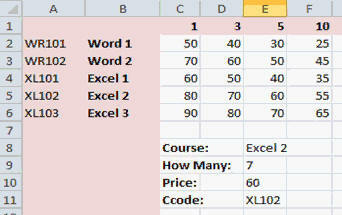 For example, we'll create a chart that shows quantity discounts for students in training classes. You'll then be able to enter the class name (Excel 2) and the number of students (7) and calculate the price per student using the MATCH and INDEX functions. You can also use MATCH and INDEX to look up values to the LEFT side of your lookup column - which VLOOKUP can't do. Next you will learn how to use the ADDRESS and INDIRECT functions to construct and deconstruct cell references. For example, you'll be able to figure out the sales between two dates (or even year to date sales) by having the user enter in the start and end dates. This will allow you to construct cell ranges like B2:B10 on the fly in your formulas. We will see a couple of examples of how to put all of these lookup functions to good use. In the first example, you'll be given two lists of names. 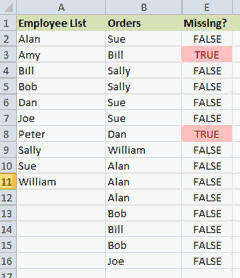 You'll learn how to compare them to figure out if any names from list one are missing from list two (and vice versa). Finally, you'll be given a list of values and a target number. You'll learn how to figure out which value is closest to the target number. For example, you've got a bunch of people trying to guess how many gumballs are in a bowl. You've got all of their guesses, now how do you figure out which guess is closest to the correct value? We'll use a combination of functions, including MATCH and INDEX to figure this one out. Again, this is the perfect class for anyone who wants to learn how to work effectively with lookup functions including the VLOOKUP function in Microsoft Excel 2010. Mastering VLOOKUP will definitely take your spreadsheets to the next level. Of course, if you have any questions about whether or not this class is for you, please contact me. Richard on 5/24/2011: The focus of this course is working with lookup functions in Excel. Topics covered include: - Using VLOOKUP to get a value from a list - Assiging a letter grade based on final average - Understand range lookups vs. exact matches - Lookup an employee's pay rate, calculate pay - Use INDEX and MATCH for enhanced lookups - Create cell references: ADDRESS, INDIRECT - Calculate year-to-date sales - Compare two lists for missing items - Find the value in a list closest to a target value - Lots More! Sarita on 10/14/2011: Very, very helpful. I like the pace, the tips, and the examples. I also like the list comparison feature as that minimizes my need to loop in Access. I'm also using Mac Excel 08 (Windows Excel to be used at my new job) and most of the functions translated with the exception of Insert Table (insert List on Mac) and naming a Table Range, which isn't an option on the Mac. I'm not sure which module the drop-down list is covered in (I bought 4,6,7) as I'd like to know how to calculate functions based on the chosen list value (as demo'd in the Match & Index section of this module where users can choose courses from a class list. On my spreadsheet, I was able to produce my drop-down course list but the match function refers to a static course row.). Overall, I was able to follow along and create examples as you taught, pausing where needed. Great job! Lynn Staszak on 2/15/2013: I finally understand the MATCH and INDEX functions! I've never found an example to explain them as well as this training does. Thanks, Richard! Benjamin Chua on 4/12/2013: time 1:18 expert level 4 - where can you find a solution if there is a drop down box in one of the colums? by increasing the rows it is not giving me a drop down box. Ben, VLOOKUP will use whatever value is in that field. If it's an index for a list, then that's the value you'll get. what if we have two people have the exact guesses? 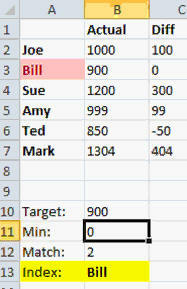 I tried it but Excel only matched the first winner's position and missed the second winner who guessed the same. Desiree, I'm sorry but you're going to have to give me a little context here... it's been over 2 years since I recorded that video, and without re-watching it, I don't know to what example you're referring. Please expand on your question. al johnson on 8/23/2013: I have a situation where I need to a number rating 8-1, depending on if you are married, divorced or single and your age less than 21, more than 21, and more than 35. How do you state that in a cell using a vlookup, lookup or reference? I'd need to know more about how your sheet is set up, how the criteria are assigned, etc. al j on 8/26/2013: What I am trying to do is create a dataase using Excel. A person keys in M for married, <2 years, then that person point will be 8, <5, then that person point will be 4, >5, then that person point will be 1. I just tried to use a lookup table but I have no clue to use less than equal to formula and lookup at the same time. Help!!! Sounds like you need to use a combination of IF and VLOOKUP. Without seeing your sheet, I can't give you any more direction. Anonymous on 4/25/2014: Hi Richard, for the LOOKUP function, does the "lookup_vector" have to be 1st column or row (of a table_array) or could it be any column or row (more like an INDEX function)?